The deep blue sea and its colorful inhabitants invite you into an underwater adventure in the new Megaquarium 5-reel, 50-payline, progressive jackpot slot! The game features in both Slotocash and Uptown Aces where you can take advantage of an excellent bonus offer. At both casinos you’ll be awarded with a 111% Match bonus and 33 Free Spins on Megaquarium as long as you use a redeem code 111MEGA33 at the time of your deposit. The minimum deposit required to become eligible for this promo is $25, and you can dive into this terrific slot from Real Time Gaming right away! All sorts of fish, crustaceans, plants and corals await you at the bottom of the ocean, along with hidden chests of treasure waiting to be discovered! Megaquarium is a feature-packed game with beautiful visual effects and 50 winning lines. There is a progressive jackpot to be won, and special features like Double Wilds, Free Spins, Multipliers, Wild Reels and Instant Wins. USA players are welcome to join in on this submarine slotastic adventure at either Slotocash or Uptown Aces online casino! 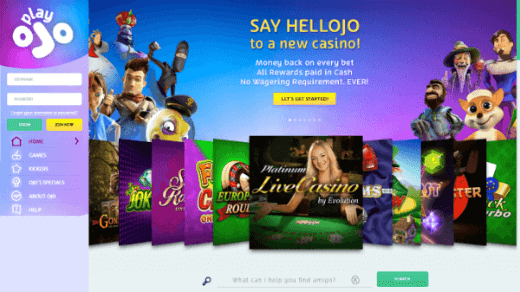 For those of you in search of a fresh online casino, PlayOJO is as fresh as it gets, considering it was just launched in 2017. All games on offer at PlayOJO casino are available in instant play mode, and originate from such developers as NetEnt, Microgaming, NextGen Gaming, Evolution Gaming and others. Pay a visit to PlayOJO and you’ll be looking at a complete multi-platform online casino venue with the best slots, table games, live dealer games, efficient banking options and outstanding bonuses and promotions. The PlayOJO brand brings important innovations onto the table, like a totally dismissive policy regarding wagering requirements. Yes, you’ve read it well – PlayOJO offers bonuses without wagering requirements attached to the bonus money and bonus winnings. Whatever you win, you can take it right home, or continue investing it into play, whatever you choose. The UK gambling market can seriously benefit from such an innovative online casino concept, and the players shouldn’t waste a minute longer – check out PlayOJO, you won’t regret it. If you thought Bovada Casino’s last offer was juicy, wait and see what they’ve come up with this time. The new welcome bonus amounts to a jaw-dropping sum of $3,000 which you can use on the stellar selection of Bovada’s 300 entertaining slots and classic casino games. The campaign was launched this February, with a 100% match bonus up to $1,000 which can be redeemed up to three times. All you have to do is visit Bovada’s website, set up an account and claim your welcome bonus with a bonus code NEWWELCOME. One 100% match bonus up to $1,000 is not enough for you? Redeem the code and raise the limit up to a maximum of $3,000 per player! Just keep an eye on the 25X rollover requirement before you wish to make a withdrawal and you should be good. Plenty of entertainment is waiting for you at Bovada Casino and its spectacular welcome bonus will only enhance the gambling experience you shouldn’t miss out on for the world!